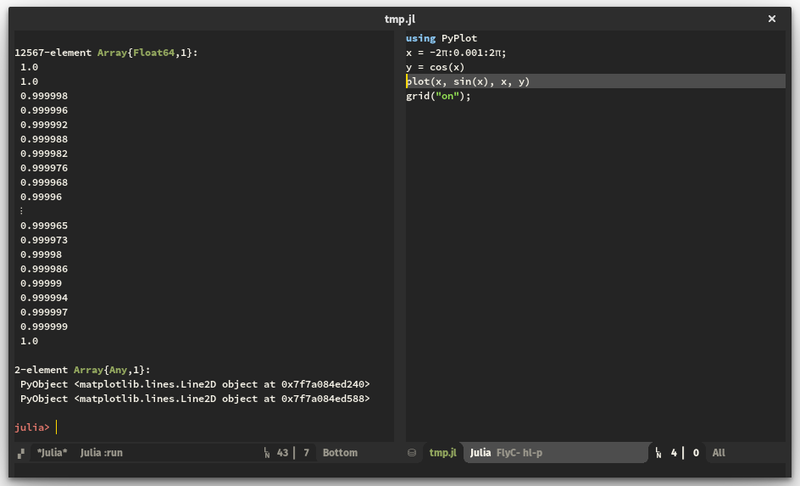 Julia is an interesting new scientific programming language. I haven't used it much in the past, but I believe that it has the potential to be a very fierce FOSS competitor to MATLAB. When I tell friends and colleagues about Julia, my punchline is usually: "It looks and feels like MATLAB, but it's as fast as C."
I'd like to start using Julia more for things like Monte-Carlo simulations and other technical programming tasks, but I am spoiled rotten by the comfort of MATLAB-emacs. I have gotten so used to interacting with a live REPL from my text editing buffer that I do not want to miss it with any other language. Julia ships with an official Emacs mode, but the support for an interactive Shell within an Emacs buffer is almost non-existent. So I sat down for a few hours this weekend and built the Julia-shell mode that I would want to use. julia-shell-mode aims to take all of the comfortable shell interaction from MATLAB-emacs to the Julia REPL. As of right now, it provides TAB-completion and sending code from a Julia source buffer to a Julia REPL Buffer, but I will probably add more functionality in the future. The code is GPL'ed and on my GitHub, I may add it to MELPA soon. More info in the README.